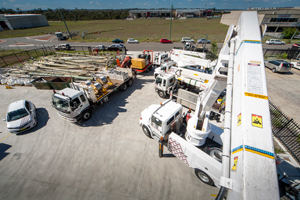 Connect Infrastructure employs more than 80 construction professionals with specialist capabilities in overhead, underground and substation installation works. Connect's industry-accredited process and systems have been designed to deliver small projects ($5,000) through to major projects (>$10 million). Our large pool of resources and experienced project managers ensures innovative and collaborative project planning and delivery strategies. Because the in-house Connect team works solely with the power transmission and distribution market, we offer a depth and breadth of knowledge and capability within our sector that includes an up-to-date and savvy understanding of delivery risks and how to mitigate them. Our knowledge and approach ensures our ability to deliver and perform under the most challenging project time frames. We routinely deliver projects through the detailed planning and execution of all on site works during short power system outages, guaranteeing minimum impact to stakeholders. Members of our construction team pride themselves on their ability to interact with and deliver client and community satisfaction. Our Innovate; Collaborate; Deliver; Power Solutions approach is much more than a logo: it expresses the lived experience and day-to-day goals of our team. Connect Infrastructure offers more than a large pool of specialist human resources. We own and maintain a large fleet of specialist plant and equipment to ensure we can meet our clients' every need.